Good thing we can always rely on our favorite comfort food. We all have days when we just want to hide under the covers or, at least, wish that the ground would swallow us whole, but neither would really make the bad vibes go away. What would make us feel better: a delicious serving of our favorite comfort food, which, in this case, happens to be corned beef. 1. When we woke up feeling ugly. No one must see us in broad daylight! 2. When our boss called our presentation trash. Nevermind that it was 50 slides long and that we missed our birthday, our parents’ golden anniversary, and basically every important family occasion this year to work on it. 3. When our officemate took the credit for all our good ideas. 4. When our crush finally came over only to ask about someone else. Sure, he’s a triathlete, models part-time, is rich and smart to boot, but what does he have that we don’t? 5. Or when we embarrassed ourselves by trying (rather unsuccessfully) to make conversation. Words are suddenly a foreign concept. 6. When our car got towed. Just when we had somewhere important to be. 7. When we were forced to babysit our bratty niece. Sass from a six-year-old: not cool. 8. When we attended that party and knew NO ONE. 9. When our visa application got denied. We went through all that trouble to renew our passport, secure the required documents, fall in line for who knows how long only to be rejected in the end. 10. When we were stuck in carmageddon for hours. The truth is, the cycle of bad days will never end. In fact, this won’t be the last time we’ll wake up feeling bummed about something. But hey, no day is too bad that a can of Purefoods Corned Beef Chili Garlic can’t fix, right? 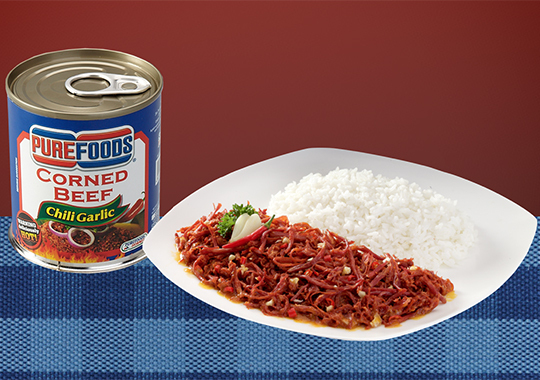 To know more about it, visit the Purefoods Corned Beef Facebook page.